Randall Park is not to be trusted. I kid, I kid. But in the months we’ve been asking people this question, Park is, without question, the one who changed his tune most quickly. Seen in one light, it’s a sign of wishy-washiness, an indication that the person in question might be fickle or easily swayed. But in another light, it’s a sign that Mr. Park possesses a quality invaluable to funny people—a willingness to stop, reconsider, and find new ways to look at a question. That, and a readiness to let the bit play out. Another mark in his favor, despite the swift, shameless reversal: The question clearly lingered in his mind. I wish I’d had my fancy journalist recording gizmo out when I ran into Park around 30 minutes later at a coffee station; he brought it up again, still weighing both options, a few brief moments sadly unrecorded. (Related: Randall Park seems to be a very nice person, so that’s a positive, too.) If, once again, we try to read into his character, I’d say this suggests that like many similarly skilled actors, he approaches even the silly, frivolous stuff with earnestness. Not self-importance—Park didn’t pretend this was a question for the ages—but genuine curiosity. Earnestness, curiosity, and an interest in looking at things from a new angle are all qualities that characterize Fresh Off The Boat, the sharp, clever ABC sitcom starring Park and Constance Wu (Crazy Rich Asians). Like the best in its genre (such as contemporaries The Good Place, One Day At A Time, Superstore, and fellow ABC series Black-ish), Fresh Off The Boat doesn’t settle for being merely charming and funny. It’s got heart, as they say, tackling big questions and ideas with the same energy, honesty, and spirit displayed in its sight gags, recurring jokes, and moments of sublime ridiculousness. It’s certainly a comedy, but it rings true. Point being, Randall Park sure seems like a standup, straightforward guy. Here’s his dubious answer to the hot dog/sandwich question. 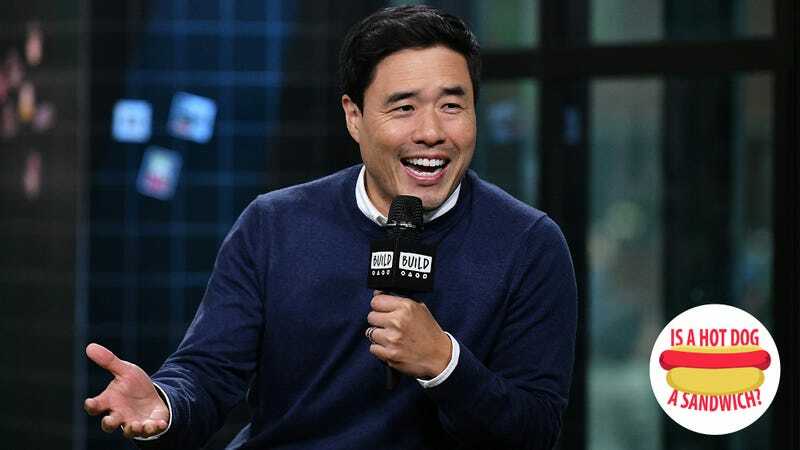 Randall Park: Ah! [laughs] Yes. TO: Why is it a sandwich? TO: It’s not a sandwich? RP: No. Well, wait. “Is a hot dog a sandwich,” that leads to the question, “is a wrap a sandwich?” Because a hot dog is a bit of a wrap. TO: It can be seen that way, sure. RP: But it’s not enclosed, which makes it sandwich-like. So it’s kind of in-between. I think it’s a glass-half-full, glass-half-empty type of thing. I’d say, it’s a... sandwich. That’s what my instinct tells me. RP: It’s kind of both. TO: It both is and is not a sandwich? RP: Yes, yes. But strength in numbers, you know, so let’s put it in the sandwich family.